I write about pop culture and other things. Sherilyn Connelly is a San Francisco-based writer. Her work can be found in anthologies including but not limited to It’s So You: 35 Women Write About Personal Expression Through Fashion and Style by Seal Press, Good Advice for Young Trendy People of All Ages by Manic D Press, and Unthology No. 1 by Unthank Books. She’s contributed to the periodicals Instant City, make/shift, Other Magazine, and Morbid Curiosity. She’s also written about movies and television for Medialoper and the popular Gawker Media blog io9, and she is currently the head film critic for for SF Weekly. She no longer co-hosts Nose Hair Lint Gland on Radio Valencia, much to their relief. 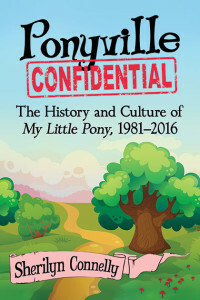 Sherilyn’s first work of scholarly sparkliness, Ponyville Confidential: The History and Culture of My Little Pony, 1981-2016, was published by McFarland & Company on March 14, 2017 and is available at popular prices!